Photo Courtesy of Anissa Brown. 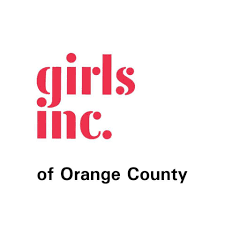 Girls Inc. of Orange County has served the Orange County community since 1954. We are an affiliate of the national youth organization Girls Inc., a research, education and direct advocacy organization that inspires all girls to be “strong, smart, and bold.” Girls Inc. is the oldest girl-serving organization nationally, dating back to the industrial revolution, and was founded in 1864. The Girls Inc. national organization is the nation’s leading research and evaluation organization on issues pertaining to girls and young women. In Orange County, we offer programs in partnership with school districts serving elementary, middle and high school sites. We also collaborate with other youth serving organizations, family resource centers, college campuses, and at our center in Costa Mesa, California. For more than 60 years, Girls Inc. of Orange County has been inspiring girls to be “strong, smart, and bold” and have changed the lives of thousands of girls in the community. Last fall, Girls Inc. launched #GirlsToo, a national campaign aiming to shift the deeply entrenched norms that lead to sexual harassment and violence in our society. It is our goal to create a culture where all girls and young people grow up safe, respected, and valued. We urge our supporters to visit our website and sign the pledge to end sexual harassment among young girls. Our hope is to unite and stop the sexual harassment and violence that girls face so we can create a healthier, safer culture for all young people. Sexual harassment and violence are pervasive issues that affect our young girls. 7 out of 10 girls experience sexual harassment before they leave high school. 1 in 4 girls will experience sexual violence before she turns 18. Among girls who have experienced sexual violence, 86 percent have felt depressed or hopeless. However, as a society we perpetuate attitudes and behaviors that harm girls and follow them into adulthood. We need to continue this important conversation that the #MeToo movement brought to the forefront. There are steps that each of us — youth, parents, educators, and concerned adults — can and must take to change the way girls and women are viewed and valued. 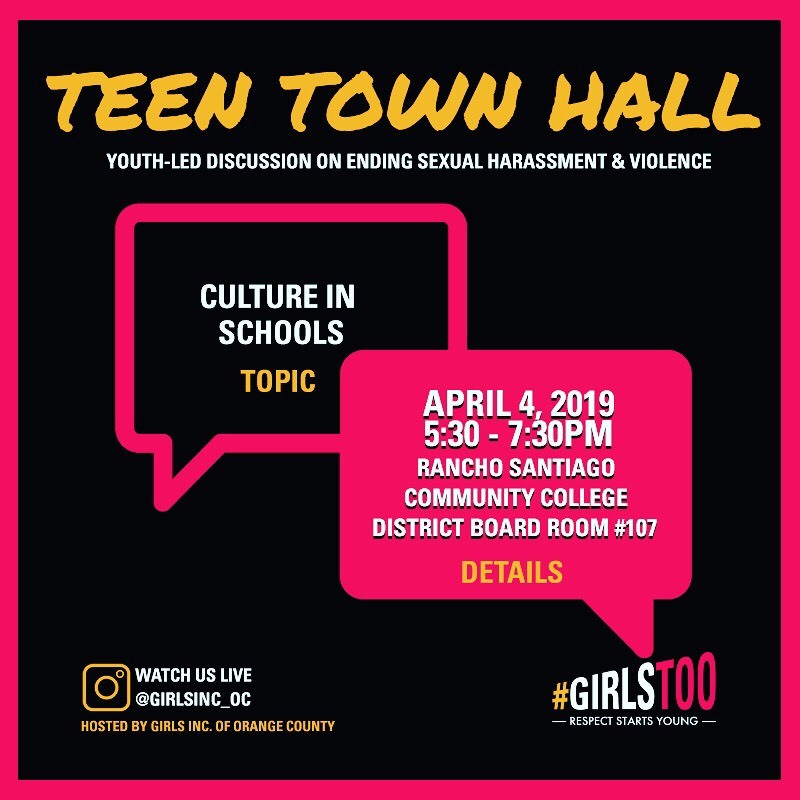 We are also excited to launch the next phase of our #GirlsToo campaign: Teen Town Hall — a youth-led discussion centered around sexual harassment and assault. We are honored to be one of the three affiliate locations chosen to host this important discussion topic. This event will be held this Wednesday, April 4, 2019 from 5:30-8:30 p.m. at Rancho Santiago Community College District Board Room. The topic of focus will be cultures in schools. For more details and to RSVP visit our Instagram, (@girlsinc_oc) Facebook, (@GirlsIncOrangeCounty) and Twitter pages (@GirlsIncOC).